As we are coming into late October, the season is slowly winding down, or is it? Today’s report will be two-fold. First, naturally, a fishing report, but also some end of season maintenance tips, which I will get to in the latter portion of the report. In terms of the Cap Mouth, I think most of the fish that were there are now up the river, especially with yesterdays rain. Our guide fleet haven’t fished there in over a week now, and I haven’t heard any reliable reports. 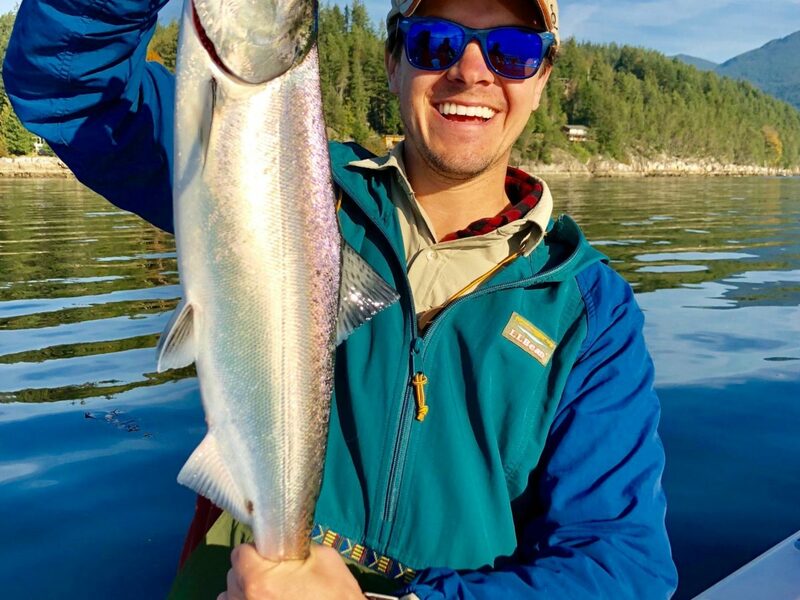 We focused our efforts up Howe Sound in the first part of the week for springs, and we did find some good fish early in the week. We fished close to the bottom, where the majority of the bait was found. In terms of tackle, glow flashers such as CB55 and BC worked well, in combination with glow spoons. With the full moon closing in, the last few days has been tougher, but there are still fish around if you put your time in. Evan having a great time on the water! Winter chinook fishing is just around the corner, but if you have taken your boat out of the water for the season, or are not planning to fish until the spring, here are a couple of tips that will make getting back on the water next season easier. Now is a good time to take the rods and reels inside for an annual service; open them up, wipe the salt and grease off and lubricate them. This is a great way to add years to the reels. It is also a good idea to check and replace your main line after a season of use. For our guide boats we like 40 lb Berkley Pro-Spec, which has great knot strength, blue in colour and is very affordable. It is also a good idea to go over all your other tackle. Make sure it is dry, wipe away any rust on your spoons, flashers, and terminal tackle. Go over your hooks, replace or sharpen any that are suspect or dull. If you are not using your gear until the spring, it’s a good idea to keep it inside the house where it’s nice and dry. If you need mainline or parts, our staff at Pacific Angler is there for you. If you are leaving your boat in the water for the winter it is always good practice to make sure your bilge pumps and batteries are working. There are always boats that sink during the winter, and malfunctioning bilges and batteries are sometimes the cause. If the boats bilge pumps don’t work, the boat would slowly fill with water, until its too late. Another common reason, especially if you have an open boat such as our Grady White fleet is that water always finds its way into the bilge, the pumps would engage, but since the boats aren’t used, eventually the batteries would die out, and the boat would sink. Therefore, its very important to a) check that your pumps are working and b) make sure your batteries are okay, giving them a charge once in a while.